Thought should be given to creating a written checklist early in a team’s experience in endoscopy to avoid overlooking a required element for completion of such a case. 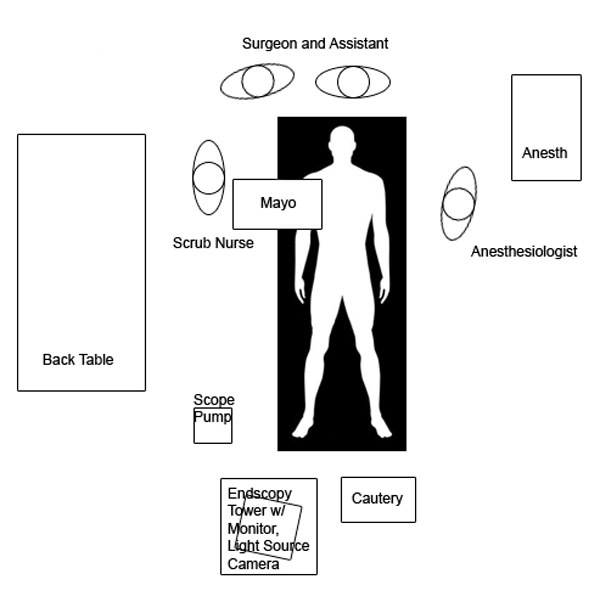 Operating Room Setup for a Endoscopic Third Ventriculostomy: Shown is placement of equipment and personnel. Image guidance equipment, if used, can be placed between the endoscopic tower and cautery. Placement of monitor: The unit should be placed at the foot of the bed in such a manner that its screen can be positioned to be directly in front of the surgeon standing at the head of the bed. This arrangement will result in the surgeon standing squared to the head of the bed and not at an angle, which will greatly assist in maintaining orientation during the procedure. It will also increase the likelihood that the surgeon watches the monitor and does not look at the patient’s head, a mistake that can lead to rapid loss of scope orientation. Placement of guidance equipment: If image guidance equipment (computer-assisted image guidance stereotaxis or ultrasound) is to be used, its screen can be placed adjacent to the endoscope’s monitor at the foot of the bed. Cautery unit: The cautery unit can be placed next to the monitor, out of the way of the active surgical field. The lines from the cautery instruments are then handed off from the field, attached, to the cautery unit, and the surgeon directs the circulating nurse in setting the amount of current desired. Irrigation unit: This unit also can be placed next to the monitor, out of the way of the active surgical field. Irrigation lines are handed off from the field, attached to the scope, and the pump is then filled in preparation for use. There should be no air bubbles in the line. Video camera, light cable: The light and video camera cables are handed off and attached to the scope. The camera is focused and oriented so that its image’s orientation matches that of the scope’s. Usually, the scope can be aimed at an illuminated object in the operating room and the camera then rotated about the scope’s head so as to correctly orient the camera. The scope is then white balance. Check video recorder: If a recorder is to be used, it is wise to check that it is on line and ready before making the skin incision. To avoid forgetting to activate the recorder, it can be requested to start recording at the point when the scope is being readied to enter the head. Supine with head flexed: The patient is placed in a supine position with the head flexed slightly, looking straight at the field. This will place the intended bur hole site at the top of the surgical field. Bur hole: A standard bur hole is drilled on the coronal suture several centimeters off midline. The position can be tailored on the basis of information from the MRI. Cannulation of ventricle: If a peel-away catheter is being used that does not have measurement markings, a mark is made at a point on the peel-away catheter where entry into the roof of the lateral ventricle is expected. The cannula is then introduced to that depth and advanced several millimeters more to accommodate the projection of the obturator. This is the point for obtaining CSF for examination, if desired. The peel-away catheter is then broken down while the obturator is held to prevent its falling further into the ventricle. The catheter’s two peeled lengths are stapled to the scalp to prevent the cannula from following the scope into the third ventricle. The obturator is removed. Navigating scope to third ventricle: After the obturator is removed and the recording equipment is turned on, the scope is checked to insure its light is on and the image is good. Its distal tip is then placed into the inlet of the cannula. The surgeon then looks to the monitor, where his or her sight will remain until the scope has been removed from the patient’s head at the completion of the procedure. At no time should the surgeon look elsewhere. The scope is then navigated down the cannula into the lateral ventricle. Before advancing out of the cannula, landmarks should be seen of the foramen of Monro or structures such as septal veins, thalamostriate vein, or choroid plexus that will guide one to the foramen. The foramen is centered in the field of view, and the scope is advanced out of the cannula and through the foramen into the third ventricle. During this advancement, the mammillary bodies are identified. Target the ETV: The infundibular recess is now identified. The ideal target for the ostomy is along the midline sulcus midway between the infundibular recess and the mammillary bodies. The location for the ostomy should be modified, however, to accommodate to any aberrant location of the vessels of the circle of Willis. This can be easily accomplished when the floor is thinned out and the vessels are visible through it. When the floor is opaque, it is important to have studied the MRI previously to know the position of the bifurcation of the basilar artery. Initial opening: A blunt object is used to make a small opening through the floor of the third ventricle. Attention should be focused on the amount of stretch of the floor, as injury can be inflicted to the third nerve or vessels of the circle of Willis by too great a downward displacement. Specialty devices such as the Grotenhuis endoscopic perforator have been developed to open floors with this danger in mind (24). If needed, contact cautery can be used to thin the floor, but the probe should not be pushed through because of the danger of injury to the basilar artery or its branches. Enlarging the opening: Next, the opening is enlarged, most commonly with a Fogarty balloon catheter, either 2 or 3 French. The balloon is positioned to straddle the opening and inflated several times. It can then be advanced through the opening, inflated, and gently pulled back, allowing the floor to slowly dilate around the balloon when a larger opening is desired. This procedure must not be done in a vigorous manner. Other techniques have been described such as using forceps to tear the opening to a larger diameter by opening their jaws while straddling the opening or using a stone extractor developed for uroscopic renal stone retrieval. The basket is opened while straddling the opening to enlarge it (25). Confirming clear communication: Once the opening is adequate, the scope is navigated down to and then through it. This step accomplishes two purposes. First, and most important, it confirms a clear pathway from the ventricle to the prepontine cistern. If any arachnoid veils are found, they can be opened with the Fogarty balloon catheter or another blunt probe. Secondly, moving the scope through the floor further enlarges the opening. Removal of scope: The scope is removed, as is the peel-away catheter. Gel foam or a similar agent can be used to cover the path to prevent blood run-in during closing. In some cases, concern about the patient’s clinical state and the need for assured normalization of ICP may exist. In this setting, a secure CSF drainage system can be considered. EVD: Prior to removal of the peel-away catheter, a ventricular catheter can be fed into the ventricle. The peel-away catheter is then removed, leaving the ventricular catheter. The ventricular catheter is then tunneled out via a separate incision per the usual routine and attached to a closed drainage system. Lumbar drain: One group has advocated using a lumbar drain when there is concern about elevated ICP and a clear communication has been established between the third ventricle and the prepontine cistern (26). They feel that use of this technique has salvaged some cases that might have been declared a failure after receiving a ETV. Ventricular access: Several have advised using Ommaya reservoirs or other internalized access ports in anticipation of failure of the ETV, necessitating emergency access for drainage of CSF to drop an elevated ICP (27-30). Closure of track: After the endoscope and peel-away catheter have been removed, a piece of gelfoam can be placed into the track to encourage its scarring shunt. Routine scalp closure: The scalp is closed in the same manner as a routine craniotomy site after surgery within the ventricles.